Flights to all of Mexico’s main airports are available daily from the United States, and Canada. Read the guide to Flying in Mexico for detailed information about flights to, from and within Mexico. If you are a holder of a U.S. Passport Card, please note that this is NOT valid for air travel to Mexico – you can only use this to cross the border between the United States and Mexico by land. A passport is required for air travel to and from the the United States. Taking a foreign (US or Canadian-plated) car into Mexico, beyond the 22 mile (35 km) “border zone,” requires a some paperwork, permit arrangements and planning. If you’re renting a car in the United States and want to cross over the border into Mexico, you must also make sure that the insurance is valid in Mexico. It is very likely that you will have to buy Mexican automobile insurance separately. You can find complete details, including information about bringing your own car, on our guide to Driving in Mexico. Daily flights operate from major European cities to Mexico. From the UK: You can fly direct to Mexico City from London with British Airways and Aeromexico; or connect to Mexican destinations via the USA with one of the American carriers. Some operators fly package-tour flights (in season) from UK airports to Mexico’s three resort destinations: Cancun, Puerto Vallarta and Los Cabos. From Continental Europe: You can fly direct to Mexico City from major European hubs including Paris, Frankfurt, Amsterdam and Madrid. Some operators fly package-tour flights (in season) from European airports to Mexico’s three resort destinations: Cancun, Puerto Vallarta and Los Cabos. Detailed Information: Read the guide to Flying in Mexico for detailed information about flights to, from and within Mexico. There are no direct flights from Australia and New Zealand to Mexico. Most travelers go via the USA, often Los Angeles. The best US cities for international through connections to Mexico are: Los Angeles, San Francisco, Dallas, Houston, Miami, Atlanta, Chicago, and New York. Check to see which route offers the best fares. It’s also possible to fly to Japan (Tokyo) and connect to Mexico from there, or else fly to a European capital city and connect through there to Mexico City (see Flying to Mexico from Europe, above). Once you have arrived in Mexico, there are numerous options for getting around efficiently and affordably. Read the guide to Getting Around Mexico (see link below) for full details, and further links to our extensive guides about flying, traveling by bus, driving, car rental, and using taxis and public transport in Mexico. If you arrive by airplane, then once you pass through immigration and clear customs, you will probably need to arrange ground transportation to your hotel or other abode. If you are staying at a major resort in Mexico, you may have arranged to be picked up at the airport by the hotel, using an airport transfer service. Every airport has authorized taxi booths; they charge virtually identical (high) prices based on a zoning charge system. Look for the words “Taxi Autorizado” as you exit the customs area, or ask one of the local staff for help. You can use App-Cab services, (e.g. Uber and Cabify) to get picked-up from some airports. See Traveling by Taxi in Mexico for details. At Mexico’s principal tourist destinations, including Cancun, Puerto Vallarta, Huatulco, Los Cabos, Ixtapa/Zihuatanejo there is an option to ride to your hotel in a suburban van. The vans fill up with passengers and make a round of local hotels depending on where the passengers in the vehicle want to be dropped off. It takes a little longer, but the ride is comfortable and you pay a fraction of the price a taxi will charge you for taking you direct to your hotel. If you arrive at Mexico City’s airport, you can connect direct from the airport to a number of popular cities surrounding the capital including Cuernavaca, Queretaro and Puebla. To go by bus to cities not served directly from the airport, you will need to take a taxi to one of the capital’s bus stations and connect to your destination from there. See the Mexperience guide to Traveling by Bus in Mexico for full details. If you’re traveling light, you may want to use the local buses or, in Mexico City, the Metro system. Buses and the Metro (in Mexico City) are not recommended if you are carrying baggage or valuable equipment (e.g. expensive cameras, laptops, etc). Gangs of pick-pockets and bag snatchers operate in most bus stations and airports world-wide, and Mexico is no exception. When you arrive in Mexico, keep your personal items in sight at all times; keep valuables well-stored inside hand-held bags, and stay present to your surroundings. Leaving an item unattended for a moment, or losing attention of your surroundings, can provide a ‘golden’ opportunity for a bag thief or pick pocket to steal from you. Connect to our complete guide to Getting Around Mexico, which shows you how to make use of Mexico’s extensive and well-developed public and private transport systems. Most of the world’s major airlines serve Mexico City, and many US carriers also serve principal provincial cities from destinations in the USA. Read the guide to Flying in Mexico for detailed information about flights to, from and within Mexico. 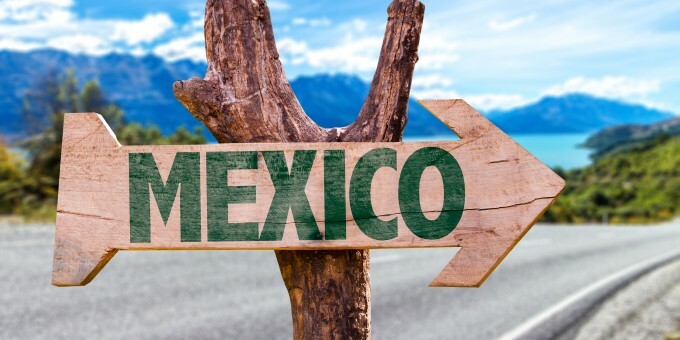 If you arrive from an international destination and plan to connect (usually in Mexico City) to another location in Mexico, you will need to clear Mexican Immigration and Customs before traveling on to your final destination. Build-in extra time between your flight connections, as immigration and customs procedures have become more time-consuming in recent years. See Mexico Entry Requirements for details about immigration and customs procedures in Mexico. Mexico has an extensive network of national airports and domestic airlines, including low-cost airlines. Read the guide to Flying in Mexico for detailed information about flights to, from and within Mexico.